And her copious amounts of cherries. She fed the birds, she fed us. Last year Rich set up the swinging seat I bought him (for 3€) for his birthday from it’s boughs. But when I look at it now I can see her leaves were dropping in July, and I believe she was dying even then. Just last month I took a picture of it and you can see where the seat was. But then we noticed two weeks ago that if you decided to sit in the seat, your bum would be scraping the floor! The hooley from a few weeks ago had wreaked the final damage on her that she could take. So Rich removed the seat and we deliberated on whether it was time to let the old girl go. She had some buds, but some parts had died and her trunk was sounding hollow. We didn’t have the heart to chop her down, but had a dilemma with the Welshies. As we chopped and split yet more logs getting ready for our new venture, there was suddenly the sound of loud cracking and snapping. The Welshies stopped in their tracks and Rich shouted ‘that’s the tree’ as an almighty crack and the sound if splitting filled the air and down she came. It was time to let the old girl go. Poor Rich, he had just put his chainsaw away, after the chain became too loose, only to get it back out. More wood! so in the evening sunshine we took two garden chairs up by the tree cracked open a beer, and said goodbye. We felt sad though, that cherry could tell so many stories, but nature showed us that sometimes things come to an end. It has changed the whole landscape of our garden. Everything must change. The chickens have been evicted from the Chicken Hilton!! As some of you know eighteen months ago we bought six chickens (the girlies) and Claude the Cockerel home to live with us. They needed re-homing and for six months they were all really happy. Sadly in the October one of the girlies died and in the spring we believed that we may have rats as the girls stopped laying eggs and some became eggbound, and despite our best efforts another three died. We were left with just two girlies and Claudy boy. I know! How can you not love her? But last month she murdered one of the last remaining girlies, and almost killed Claude, but the boy lived to see another day, so then we were down to two chickens. As you can see the chickens had a massive enclosure that took up a large part of our garden and they also had half of the old goats shed as their home – it was huge, and poor hubby was trying to squash his many garden acoutriments into one half of the shed whilst two chickens chose where to sleep each night because they had so much room! It just didn’t make sense, and at times Claude and his girly just looked lost. So this weekend Hubby set about making them their own retirement home – we thought that the remaining girly was too old to lay eggs but we were wrong (and that will be my next story). So, as you do, on a limited budget, you make use of what you have. Off Hubby went oo his barn and found out some old wood we had ripped out of our kitchen and an old bathroom cupboard we had in our bathroom (no surprises there!) which had legs on it and set about making the chickens a new pied a terre. Firstly he had to make them safe from said serial killer so he shut the chickens in the Chicken Hilton whilst he built there new enclosure. But Wiglet the Serial Killer leave it? No would not leave them alone and kept digging to try and get into them! After numerous attempts by hubby to block the door: He locked it, put wire inside it, wire outside of it, put a piece of corrugated iron against it, followed by an old door, all whilst he was trying to get on, he gave up and he caught the serial killer, who is a little bugger, and locked her in the newly built enclosure; so he could get on and build the chickens new house. It was a big job to take the old enclosure down as to stop said killer getting to the chickens when they first arrived we had put huge pine logs against the double fencing, and they had to be moved..
Hubby did good though and in the end the chickens downsized, as you tend to do when you get older, and moved into a pretty little beach style cottage, placed in the sunshine, with a little plank up into it (easy access for when you get older) and some lovely new hay. It is fair to say that they are as happy as happy can be in their new home. We did make a discovery though, the poor girl had not stopped laying, we found broken eggshells in the Chicken Hilton and five eggs that she had hidden under the straw – all an indication of rats! And that is another story from our adventures of living in rural France! Thanks for all your support and please share my posts and comment when you can, I love the interaction. As I sit here this morning, with my first cup of tea of the day (I am English after all!) I have found the urge to write. The picture above is my garden at this present moment that I am writing this. The view from the valley as you can see is totally obscured because there is a thick fog and autumn has finally rolled in. A complete contrast to just weeks ago..
For the first time this season we have condensation on our windows, and single figure temperatures outside, but our house is warm. The roof on our kitchen has finally been replaced (more of that to come in another post) and add to the mix our new front door and the difference it has made is immeasurable. I smiled to myself today when I looked at our doors, and there was no condensation on them. Sadly they are nowhere near as pretty as our old door, but it had to go, it was beyond repair (and trust me I tried) the oak had split from the hundred years of driving rain and wind it had endured so it could not be saved. We have re-used it (as you would know we love a bit of old and vintage, and will repurpose where we can, you only have to look at our Etsy shop) as a feature in our garden, it now plays the part of a secret door into a fairy kingdom. I know we’re mad! But helps in life sometimes! I love the autumn, One of the biggest things for me about living here is the changing of the seasons. I’ve said it before and I will probably say it again; it is a constant reminder that things change, and that although they will come back again they will never be the same as the one before. Nothing in life ever is. For me the autumn is the most poignant because all the things are dying off, it is the end of something that you will never get back, and it is a reminder to treasure every moment. As some of you may know I am sharing a story from long ago about Rich and I, it has taken off. It is a sad story, but remembering where we are now, it is a story of hope. It too is a story of something dying and then coming back again, but in a different way, it was never going to be what it was before. Perhaps it is apt that I decided to share it in the autumn! For those who have read my blog over the years you will know it made us stronger, and gave us the courage to take this adventure; and despite the hardships we have had along the way they have never broken us, almost sometimes, but we have always got through. We have learnt that money really does not buy you happiness, and material things may give you comfort but they don’t make you happy. Because despite having no water, no roof, a leaking cesspit, dodgy cars at one point, and at times been down to the last six euros to our name, things have always come through, because we are happy in our minds. We have the ability to laugh, sometimes at each other, every day. We lost our egos. So yesterday we read a passage from the Tao and the explanation asked a question, to think about what you thought made you happy and then ask yourself if that were true. It was designed to help people realise that the material things they bought did not really make them happy. So Rich and I both thought about it independently and both came up with the same answer, independently: it was to sit in our garden and look out across the valley. Have a food day folks, enjoy the small things. PetiteFrenchfancies @etsy is my shop full of eclectic (of course) things. It’s been awhile since I have blogged on here, we have been busy with the roof, and I have been even busier with my new blog. The response to it has been phenomenal, thank you all. But as I have said the Moisfrenchadventure blog is my ‘home’ because it is my first blog and it is about the here and now; and our life together, now. Sadly one of the changes has been that our two little Amigos, also known as the Princess and the Pea because they were so close, are now at each others throats, literally! We cannot even have them in the same room together on leads and blood has been drawn on a number of occasions; we are at the point that they cannot even go for a walk together. I feel so sad about this, as I am writing this blog I am looking through the photos of the last year and them together and it is bringing tears to my eyes. Wiglet could do no wrong in Dylan’s eyes. They played with mop monsters in the garden, Wiglet taught Dylan how to get the chicken’s tail through the fence and worried about her when she was riding with daddy on the mower. They searched for rats and mice in the woodpile, and Wiglet taught Dylan how to dig her first hole. Wiglet was truly Dylan’s hero, they were inseparable. But in the summer another dog was in the mix for a week, another Welshie, she attacked Wiglet first in our garden and Dylan got caught up in it and bit Wigs as well. They made it up, but the same dog then attacked Dylan in the rental property Karen was staying in and a week later the unrest began. We hoped it would die down in the weeks that Dylan had been in England, but it hasn’t and in fact it has escalated. I am so sad, it is the end of happy times, and I just hope against hope that as Dylan gets older they will be friends again. But as I say everything changes, and we have to go with that, and autumn is blowing the changes in quickly now. Goodbye Princess and the Pea, it was real fun while it lasted. A week ago a dear friend bought me these flowers from his garden. We had invited him and Matt our young French friend around for a bbq, we wanted them to meet Jenny and Karen and despite the thunderstorm that hit just as we were serving the food a wonderful evening was had by all. But as with anything in life everything must change, and our holiday has been and gone, Jenny has flown back to England and my flowers have died. To finish the last few days of Jenny’s holiday and to celebrate Karen’s birthday we visited the vide grenier at Evron on Sunday, and found it’s beautiful medieval church and monastery and a small little bar in the square, a rare thing in rural France to find a French bar open! We were so excited we sat there for a couple of hours drinking in the atmosphere, and ruby beer of course! As you can see we had a typical French time, beer and baguette! We meandered our way home and sat in the garden star gazing, and drinking wine (no! I hear you cry!) and had a supper of minted lamb chops, chips, peas and tomatoes …….mmmmmmmmm. For Jen’s final day we took her to Fourgeries, I did say recently we have decided we should visit more often….. we are looking forward now to visiting this breathtaking city in all seasons, with the different colours that they bring to the old French buildings. As with rural France in August everything shuts for the vacances, so our plans to eat were scuppered and I rustled up a mean spaghetti bolognaise and garlic bread with some help from the girls when we got back home. And then that was it! After all the weeks of building up Jen was going back home; and we are left with the memories of the last ten days, with the laughter echoing around the garden. It really has been brilliant…. It is as if the weather knows that our mad, crazy, wonderful days of summer are coming to an end; the sun is not showing it’s face until the evening, and, although it is warm it feels kinda sad. Only six days to go and Karen will be on her way, where has that time gone? But I know that, sad as I am, we have to let go to make way for new things, nothing can stay the same; and as if to remind me, my husband bought me some new flowers for our wedding anniversary yesterday, just as I let go of the old the new came in the door. There is lots to tell you soon…… and there will be lots of change, so keep reading folks, things are starting to get busy…..
Found this as a memory today. A retrospective blog about packing up our house in England for our adventures, showing how hard making this type of decision can be. But now I sit in my home in France and look around the room, and my friend was right: people make a home. I realised as we packed away Thom’s room that we never did get around to changing his carpet! Rich and I sat in the back room today, our snug, with the log fire burning, music playing. I got tearful about leaving our house. It will always be one of, probably the most beautiful houses I have ever had the privilege to live in. But…….We talked about the whole picture, how Herne Bay is a lovely place to live, but if you asked me if I want to live in this town in another ten years the answer would honestly be no. I am bored with the walk along the beach path. I have done it nearly every day for the past ten years. Life is for embracing new things. There is a whole world out there to see and experience. So we wanted an adventure, and we have really got one now! 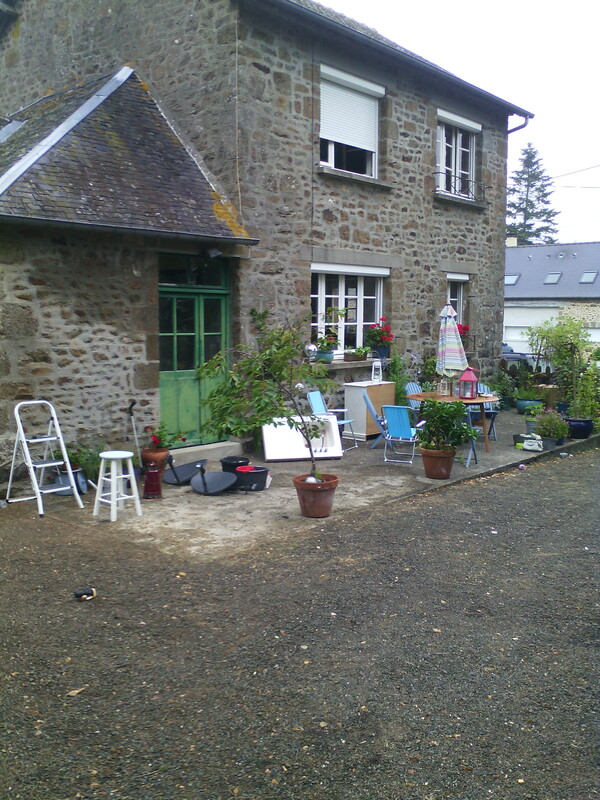 In the last 19 days Rich and I have travelled backwards and forwards between Mayenne, where our new home is, and Ruille sur le Loire, our rental property, 9 times to move our belongings, a total of 1620km! On Saturday we were heaving heavy furniture in 38°. To say we are now knackered is an understatement. But the positive is that we are now fitter than we have been in a long time, and have both lost over half a stone in weight. I have a chronic injury to my psoas muscle, and when I lived in Herne Bay I struggled to get off the sofa because of it. Now it hardly plays me up at all apart from when I am trying to get in and out of high vehicles, when I then have to do an impersonation of a weeble because my leg muscles just don’t have the ability to pull my heavy arse up! On Monday when we had moved all my plants and arrived back at our house at 9.30pm my newly found muscles saved me, after I had a nasty fall in the barn in the dark and fell onto the arm I have broken 4 times already. I swear that if I hadn’t got my newly found fitness I would have had a nasty situation on my hands. Hey ho, all part of the adventure! I have added some picture of our new home, with all of the aforementioned plants, so you can start to relate to what we are doing. Look out for many more.